Most of you will know that I work full time in the NHS as an Occupational Medicine Registrar. Running Medic Footprints for over 2 years whilst remaining in medical training has presented as a rollercoaster of challenges; mainly time management and burnout prevention strategies. What I found particularly difficult was my concerns that others would perceive my work as a conflict of interest against the NHS. Especially when they believed I was encouraging them to leave. Having sent in my video elevator pitch and attended a coaching interview with Prof Tony Young, Harpreet Sood and Toby Stone, I found myself on the programme with 100 other entrepreneurial doctors. Who knew there were so many doctors in the NHS; secretly working on their other projects whilst continuing work as a clinician? Our first Pit Stop took place on 23 -24 Sept, at which point it became clear that the year was to become an educational journey like no other. Approximately 60 mentors, speakers and fellows attended over the 2 days. 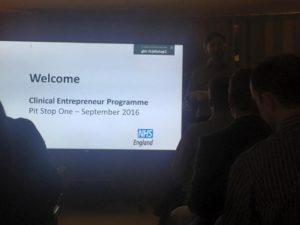 Contrary to the expected entrepreneurial wear (flip flops, hoodies and ironic t-shirts) and more consistent with the NHS mindset, most of the fellows rocked up wearing suits and ties. Toby Stone and Prof Tony Young went for the somewhat vintage entrepreneurial look – blue jeans and white shirt, stating that this was as formal as they got. 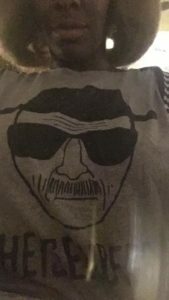 I went for an enigmatic t-shirt of a well known fictional entrepreneur. Prof Young announced that there was no other program like this in the world. We are all chosen as agents for change as part of the Five Year Forward View and he’s expecting that the numbers in this program will increase in the hundreds every year. The Pit Stop was the equivalent of a crash course in business startup, which included presentations covering the NHS Finance Structure, Legal Advice for Startups, Impact Investment, and The lean entrepreneur. The event concluded with an inspirational experiential story by Randeep Grewal – multiple entrepreneur, investor and ex-Vascular surgeon. Randeep ran several businesses from medical school and throughout his training from Cosmetics to Hardware. He used this as his training ground for business until he eventually left clinical medicine to work financial markets as an analyst and portfolio manager in London working for a top ten hedge fund and then for the world’s oldest fund management company. He described never having had a programme like this to support his entrepreneurial endeavours, taking into account he worked 140 hour weeks whilst managing a team of people in his offices – one of the early ones was above Lloyds Bank in Cambridge which was on the corner of 2 roads, hence he advertised the business as having 2 separate addresses so it would appear that he had multiple offices! Having networked with several inspirational doctors with various ideas, projects, and plans for innovation in healthcare, I feel extremely privileged to be part of this pilot cohort. The programme is effectively allocated a zero budget, hence we all literally have to put our money where our mouths are. All mentors freely volunteer their time towards the programme and with upcoming opportunities such as a study trip to Singularity Expo in San Diego, its about who can fundraise £3.5k for themselves to attend! With Prof Tony Young concluding on the note that this programme is very much self-directed, with an celebratory award handed out at the end of the year for the biggest notable failure, this is the motivation I need to take Medic Footprints to the next level. As clinical entrepreneurs, most of you won’t make it. But I’ve brought you together to work together and leverage that one or few that will. We collectively are now a time bomb waiting to go off and make a big dent in the Healthcare universe and I for one won’t be able to rest until at least one of us makes that happen and sets off the chain reaction which will follow. The best thing we can do is all help one another to become leaders. This Pit Stop heralds the explosion of innovative activities among medics within NHS. There’s no more need to hide! Follow #nhsclinent to keep tuned in to the explosive movement!